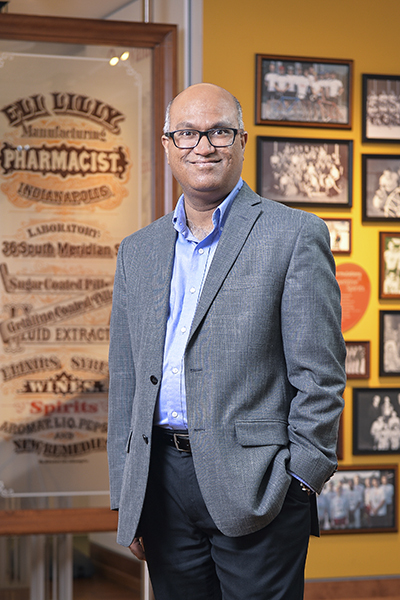 In March of 2018, Vipin Gopal, PhD, MBA came to Eli Lilly and Company to take on the role of chief data and analytics officer. No small task, he is responsible for the multinational company’s enterprise-wide data and analytics strategies and execution. “I am excited about the impact and possibilities of data and analytics in healthcare,” he says. Gopal believes that they can transform healthcare for the better. Gopal developed his passion for data and analytics early. A math protégé, he attended the Indian Institute of Technology, Bombay, and then moved to Carnegie Mellon University for his doctoral education, an experience that stoked his passions for applied mathematics, a field he has been in for more than twenty years. Gopal cut his data-analytics teeth doing, quite literally, rocket science. “Healthcare is a different kind of rocket science,” he says. In the world of rockets and the like, you can model the underlying physics to a high level of precision, he explains. However, healthcare involves many variables, including human physiology and behavior, which are not well understood. These nuances create interesting challenges. “We break down complexities in manageable ways to answer questions,” he says. Gopal’s team is bringing advanced capabilities such as artificial intelligence, machine learning, and predictive analytics to address pertinent business questions in various functions at Lilly. His interest in healthcare came from an unexpected source: a desire to honor his father, a man who spent his career in the insurance industry in India. After his father’s death in 2006, Gopal decided to honor his legacy and shift into the insurance space, serving in leadership positions at health insurers Cigna and Humana. In his current role, his goal is to help develop new and better medicines and solutions for patients with high efficiency and speed, based on insights generated from high-quality data. To achieve this, Gopal is continuously identifying and building capabilities in strategic advanced analytics and data science disciplines. As an example, he points to the development of natural-language processing technologies, explaining that rapidly mining huge amounts of text can improve research methods. However, larger, better data sets and analytic solutions are not sufficient by themselves. To make an impact, it is critical to ensure data analytics solutions are enabling significantly improved business results, not just sitting on the shelf. Toward this end, Gopal’s team partners with other departments to identify and solve key business questions. “The biggest success factor for analytics functions is creating value by addressing business priorities,” he says. Of high interest to Gopal is making an impact across the pharmaceutical value chain. The industry average, he says, is at least ten years for a new medicine to go from initial discovery to regulatory approval, and then onto the patients who are waiting. Much of this time is dedicated to clinical trial studies. To reduce this wait period, Lilly is leveraging data and analytics, along with other efforts, to significantly improve the speed of its development activities. It has reduced the average time from first human dose of a potential new medicine to commercial launch by more than two years. “My team is working to improve data and analytics competency across the corporation,” he says. These functions, traditionally, have existed in various departments across the company. Gopal envisions a balanced, federated data and analytics structure with a centralized core, allowing him and his team to form partnerships to solve key business problems and develop next-generation strategies for data management and analytics. This will also create opportunities to share knowledge and ideas, he says. Gopal finds pride in helping and growing talent to become key contributors and leaders. Starting ahead of the data analytics curve, he is excited that his work that has impacted multiple industries. Although it’s not quite rocket science, Gopal has embraced the complexities of healthcare and the seemingly endless possibilities data and analytics may unlock in its future. Vipin Gopal has always had a passion for promoting diversity and inclusion, specifically in the technology industry. At his previous position as the senior vice president of analytics at Humana, he served on the company’s Inclusion and Diversity Council and was an executive cosponsor of an employee resource group. He specifically challenged the low rates of women in the field by leading a majority-female team. “I was fortunate to build a leadership team with lots of women on it. This attracts other women because the organization is reflective of who they are,” he says, sharing credit for the achievement with his team. Ever the data analyst, he points out that the team’s high performance demonstrates the feasibility of female success in tech. At Lilly, Gopal is continuing his commitment to build diverse teams. This includes multidisciplinary teams with individuals from different backgrounds, academic and otherwise. “Solutions to big, complex problems must come from many disciplines, from diversity,” he says. HCL values “Relationship Beyond the Contract” and “Diversity” and is proud to be the strategic technology partner to Eli Lilly.